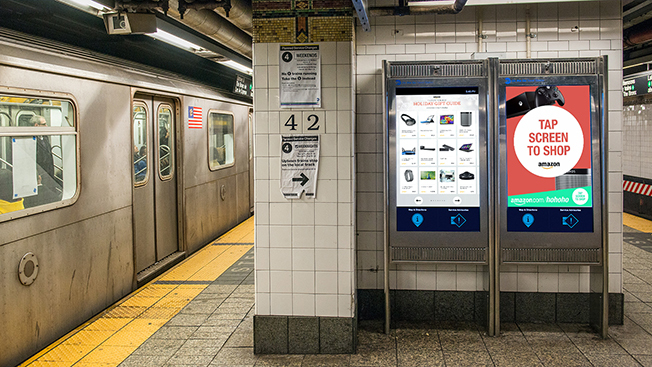 Earlier this year, design firm Control Group partnered with New York's Metropolitan Transportation Authority to roll out large digital kiosks underground that display maps of the city's transit systems. Today, Amazon is the first advertiser to use those kiosks as digital pop-up stores to drive sales of holiday gifts. Amazon's promos are running on 100 digital 47-inch screens in 12 major hubs in New York, including Grand Central Station, Union Square and Brooklyn's Barclays Center. Collectively, the kiosks target 1.2 million riders per day. Half of the screens are placed on subway platforms and the other half are near entrances and high-volume areas. Creative content on Amazon's ads differs between the two areas: Ads in the mezzanine area focus on branding while promos near trains drive sales. The digital screens are swipe-able and let consumers browse through a curated list of electronic holiday gifts from brands like Bose, Samsung, Sony and Belkin. Each item can be tapped on for more information, which also pulls in real-time pricing. After finding a product they want, riders can scan a QR code or send a text message or email and receive an Amazon.com link, where they can buy the gift from a smartphone once they're above ground. Amazon's campaign runs through Dec. 23—the last day consumers can buy something online and have it delivered by Christmas. Eventually, the design firm Control Group wants to enable programmatic buying that allows advertisers to run out-of-home campaigns on the fly. To kickstart those efforts, it recently partnered with demand-side platform Vistar Media to tie traditional and digital media buying together. "When you do encourage someone to come over and engage with the ads, you have the ability to engage one-on-one with them, and that's where the role of programmatic has a huge opportunity," explained Damian Gutierrez, associate partner at Control Group. "If you are able to understand something about that person who is interacting with the kiosk, then you can serve them more relevant advertising."